Shabaka and the Ancestors aimed for transcendent — and briefly got there last night (June 28) at their first Canadian appearance at the Toronto Jazz Fest. 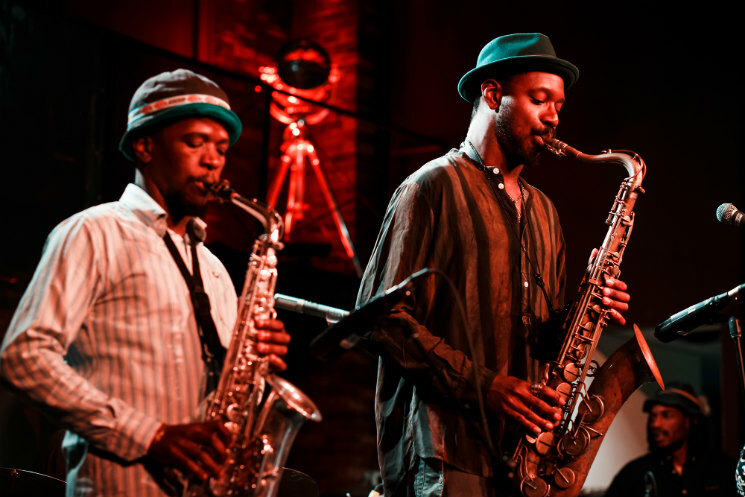 UK tenor saxophonist and bandleader Shabaka Hutchings — known primarily for his main jazz outfit Sons of Kemet and his collaborations with Sun Ra Arkestra, Mulatu Astatke and the Heliocentrics — formed the collective after visiting South Africa and being blown away by the local jazz scene. He connected with a few local artists and the result is the free-jazz crew that graced the newly reopened venue Concert Hall. Despite an unfortunate technical issue — a broken bridge on Ariel Zamonsky's upright bass forced him to switch to bass guitar, ultimately altering the texture of the performance — the band delivered a blistering 45-minute set of "I was there when" proportions. Their 2016 album, Wisdom of the Elders, is a hidden gem of a project, blending UK jazz sensibilities into a South African musical context, connecting syncopations with an Afrofuturist mindset. Hutchings' sax mastery combined with the evocative vocals of Siyabonga Mthembu to illuminate a jazz soundscape supported by Mthunzi Mvubu on alto sax, Gontse Makhene on percussion, Tumi Mogorosi on drums and Zamonsky on bass. Compositions such as "Mzwandile," "The Sea," "OBS" and "Nguni" come off even more vibrant live as they do on their debut record; the short but sweet set aimed high and soared high, but it left a sonic impact that remained long after they left the stage.